Hollywood Reporter is saying that Pom Klementieff, who appeared in the recent "Oldboy" remake, has been cast in "Guardians of the Galaxy 2". No word yet on what her role is, but the article says that Marvel was specifically looking for an Asian actress. Edited by Fortress Ironhold, 17 February 2016 - 01:45 PM. Mantis is the most likely choice, given they were specifically looking for an asian actress. Thrilled with that, if true. Will also accept Phyla-Vell and Moondragon (returned from the dead via the power of one of the Infinity Stones). Oh an ultra snarky Moondragon would rock but, yeah, it's probably a deadpan Mantis. They need to change color tones though. Too much green. Gamora, Drax, Mantis, Moondragon are all green-ish. Maybe Moondragon's costume is green but she's kind of human colored. I've seen and heard Gunn mention a few times that he plans to keep Quill as the only human, so Mantis would be a very good guess. But who knows! Well, Drax isn't human and doesn't seem like he ever was, so they could simply make her Drax's daughter who Thanos killed. But it's also totally a non-issue since she's obviously Mantis. That being said, who would be a good Moondragon? Olivia Wilde would be good, but rumor has it she's Marvel's top choice for Captain Marvel now. Technically Mantis is a half-Vietnamese, half-German Metahuman (Enhanced by a religious sect of Kree) from Earth, but I doubt that will be in the movie. Yeah, if we can just decide Drax is an alien than we can do that with anyone else. -ZacWilliam, except Cosmo who really needs to be an earth dog. Oh, wow. See, I just always assumed from the "Celestial Madonna" thing that she wasn't from Earth. I never did find her early stuff to read, but I love her costume from back then. And yeah, if Drax is no longer Arthur Douglas, then all bets are off and anyone can be from anywhere. "Celestial" is an old, racist term for Asian people, as well. Entertainment Weekly is reporting more information about the sequel. 1. Kurt Russel has been cast for the film, and rumors say he may be Star Lord's dad. 2. 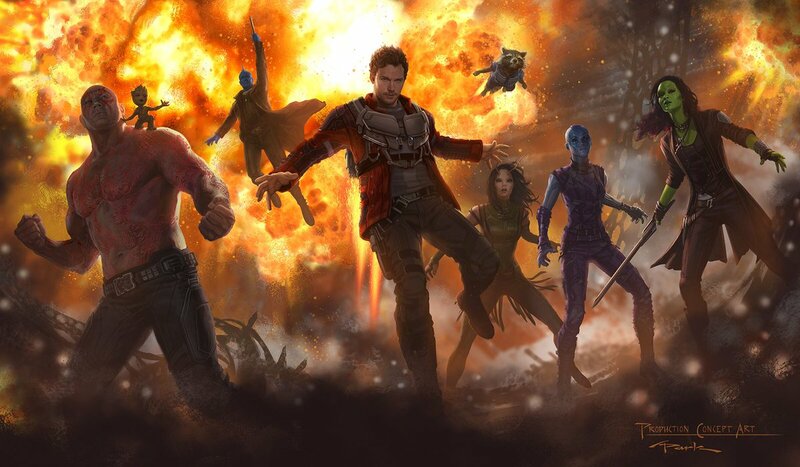 The film is slated to be called "Guardians Vol. 2". 3. The scheduled release date is May 5, 2017. I'm absolutely down for Kurt Russell joining the MCU. And I'm also looking forward to caring about Mantis for the first time ever. I was half-convinced Deadwood made that term up. It's by far the nicest-sounding racist insult I've ever heard. Edited by Sean Whitmore, 17 February 2016 - 07:27 PM. Tommy Flanagan will be a member of Yandu's crew. Stallone was seeing leaving a hotel where cast members are staying... with a script in his hand. This has led to speculation that Stallone might now somehow be involved in the filming. First piece of the movie's concept art.